Yesterday, I purposely made more clam stock than I needed when I made soondubu-jjigae. The reason for this was so I could make today’s lunch, bajirak-kalguksoo. Bajirak is a manila clam but you can use cockles or little neck clams, which are easier to find. 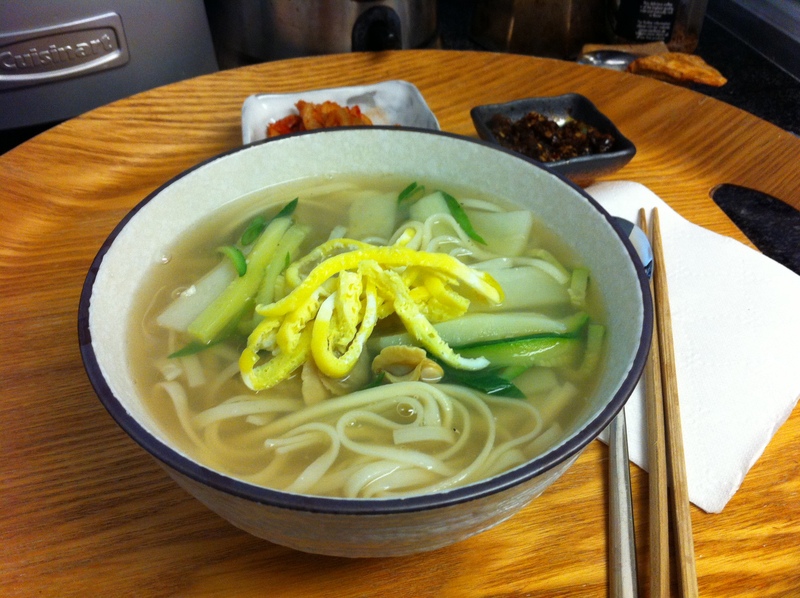 Kalguksoo literally means “knife noodle” because it is traditionally a fresh pasta rolled out and cut with a knife. It is not a hard pasta to make from scratch but it does take extra effort and time to do so. I usually buy the premade kalguksoo at a Korean market. You can purchase it fresh or dry and even the fresh ones last quite a while in the refrigerator. 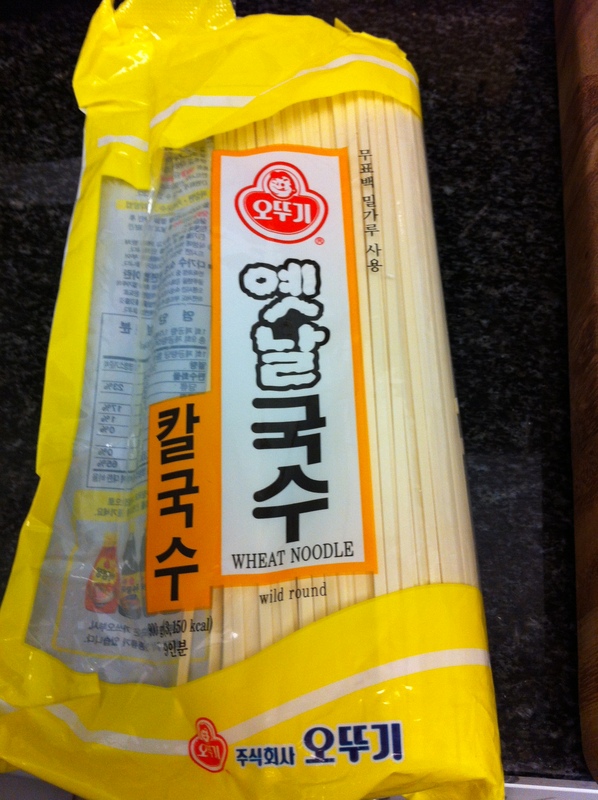 Today, I used the dry kind, which I usually have in the pantry because it is one of the most versatile Korean noodles that can be added in any number of soup dishes. It took only about 10-15 minutes to make and all I had to do was to add some zucchini, potato and scallions with the noodles in the clam broth. You can also use myulchi broth instead of clam broth. Note that this recipe yields two servings. About 4-5 cups of clam broth or 8-12 cockles or little neck clams to make the broth (instructions below). You can also use myulchi broth. 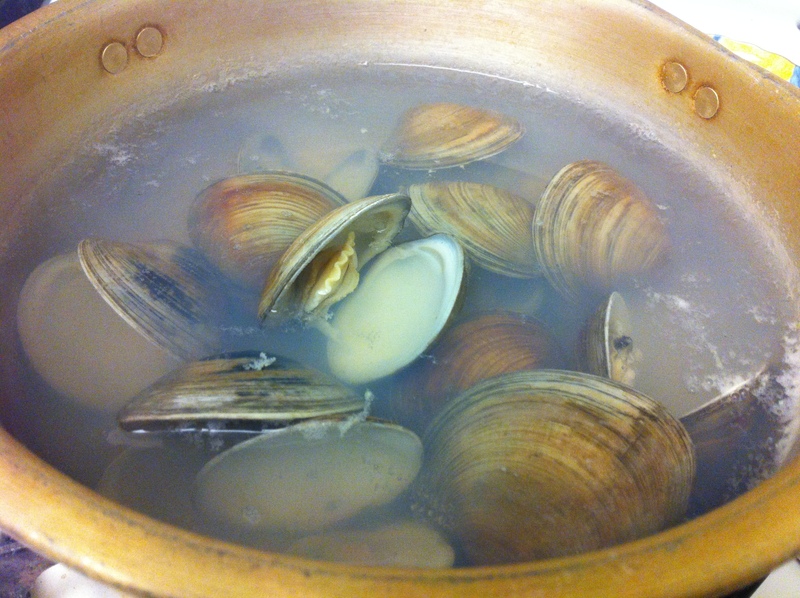 If you do not already have clam broth as I do, soak the cleaned clams in cold water with a little salt. Cover the bowl with foil and place them in the refrigerator for at least an hour. This dark salty water emulates the sea and the clams will spit out sand they have. This process is called haegam (해감) in Korean. 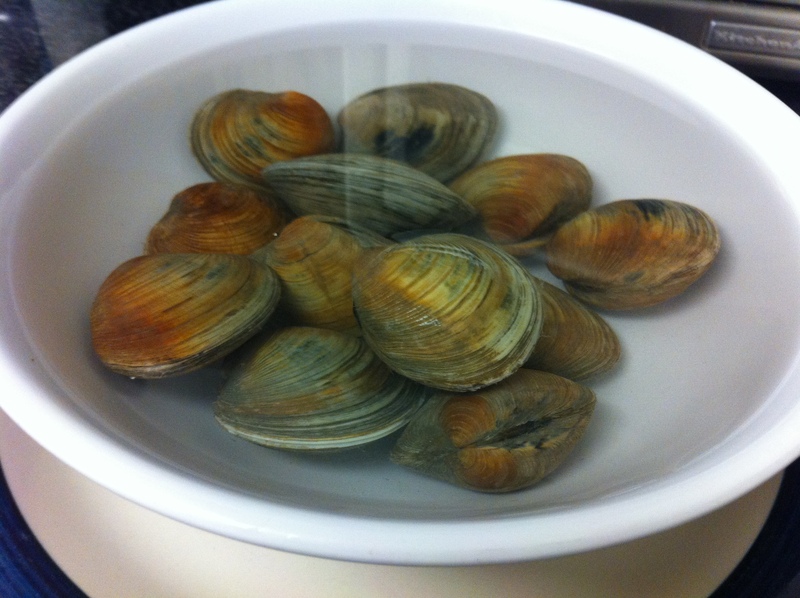 After clams have been soaking for about an hour, drain the water and rinse it under cold water once more. Boil the clams in about 4-5 cups of water for a few minutes until the clams are all open. Discard any unopened clams. Place a cheesecloth over a sieve and drain the clam broth over a bowl to catch any remaining sand the clams might have had. You can use a coffee filter if you do not have a cheesecloth as I did. Separate the clam from their shells if you like. Prepare the vegetables. 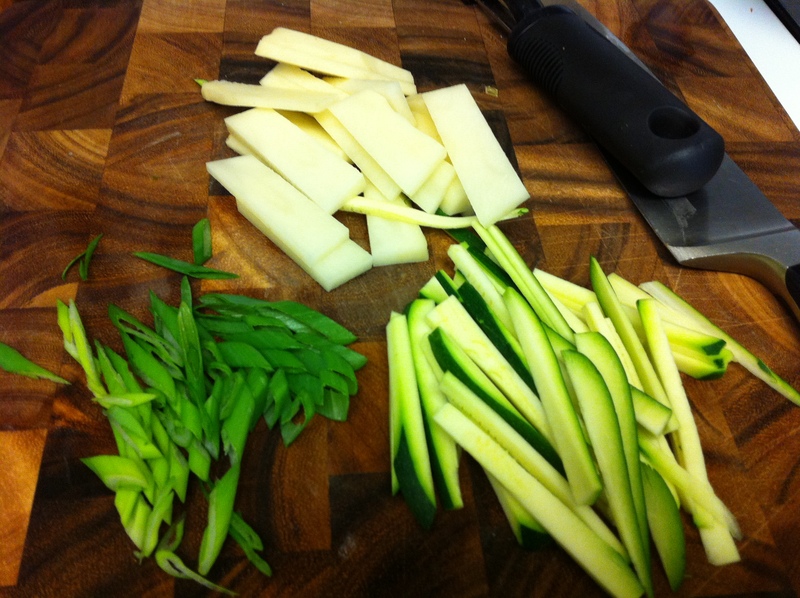 Do not cut the potato too thinly because they might fall apart in the soup. 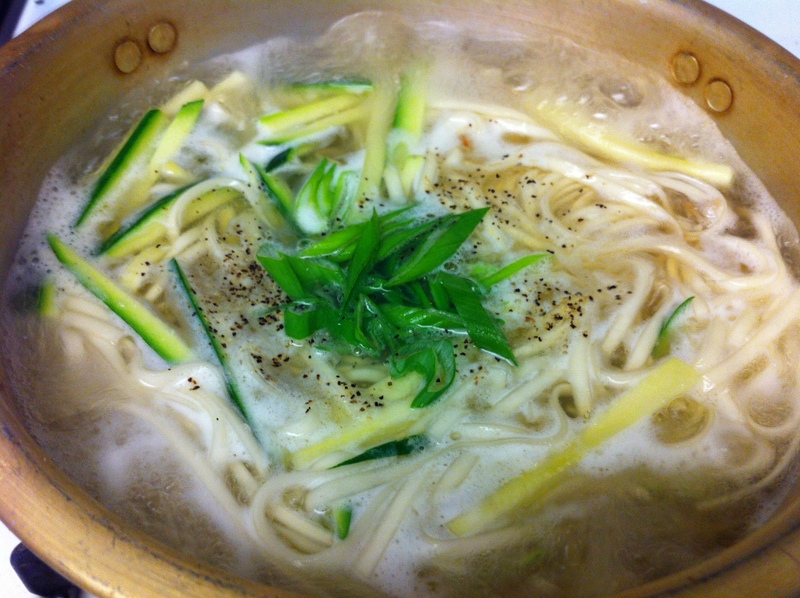 Bring the clam broth to a boil and add the zucchini, potato and kalguksoo. 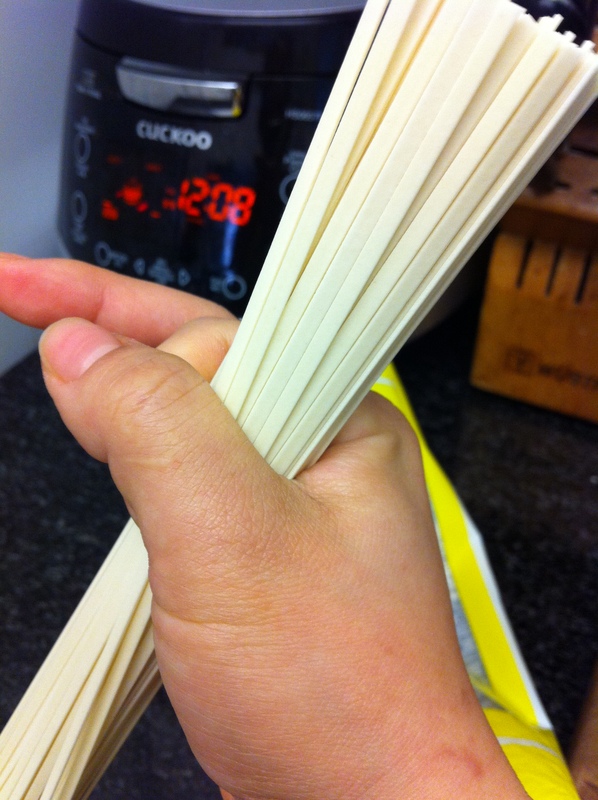 One serving of kalguksoo is measured by holding the noodles between your index finger and thumb (see the photo below).Cook the noodles according to the package instruction. I cooked mine for about 7-8 minutes. Season with salt and pepper and add the scallions. I had left over dalgyal-jidan (달걀지단), which is thinly sliced cooked egg, that I used as a garnish. 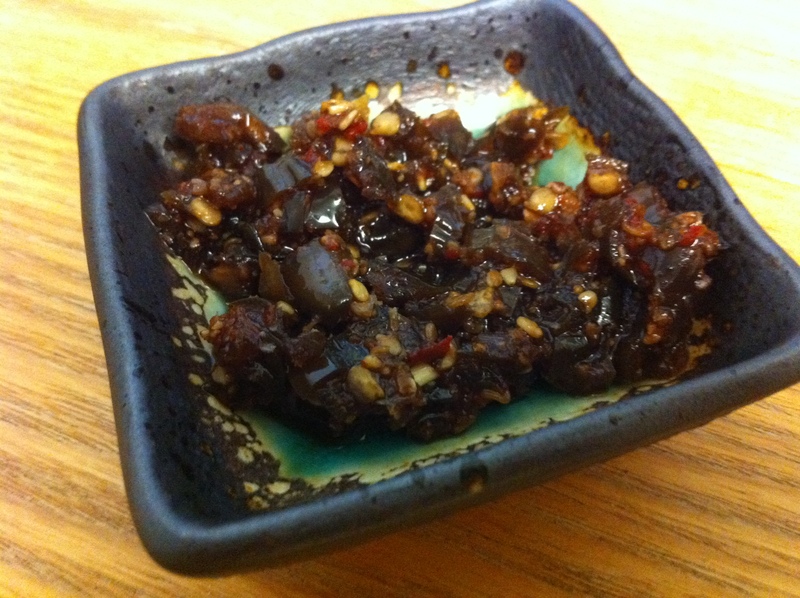 I also served the dish with a spicy gochu-jangajji (고추장아찌), that is a pepper or chili pickled in soy sauce. Finely chop the gochu-jangajji and add a teaspoon of it in the bajirak-kalguksoo to add spicy deliciousness. 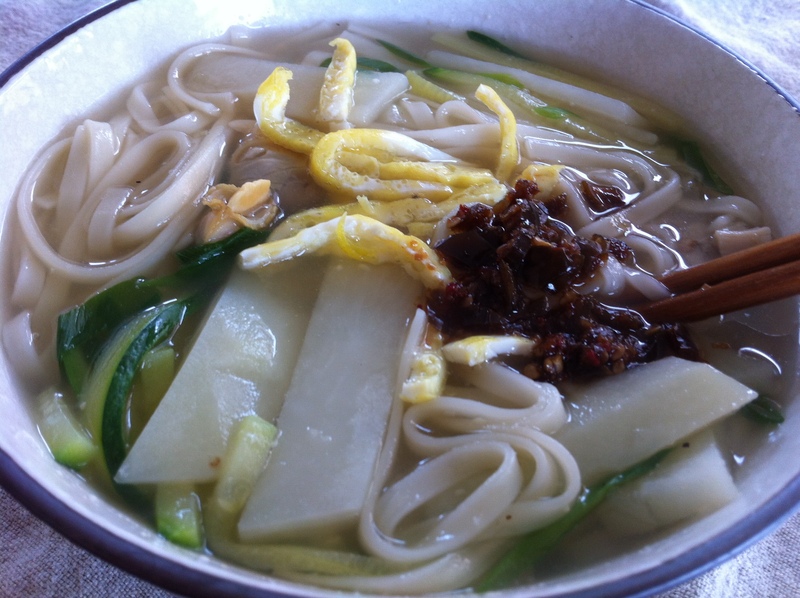 This entry was posted in Good for dinner, Good for lunch, Noodle Dish, Seafood and tagged Clams, Gochu-jangajji, Kalguksoo by gangnamkitchen. Bookmark the permalink.